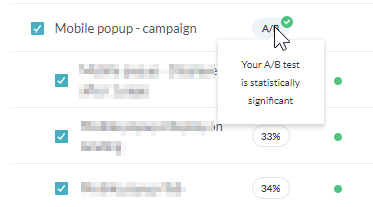 An AB test allows you to compare two versions (or more) of a popup against each other to determine which one performs better. What can you A/B test? Targeting rules: should you add a delay before display or should you display your popup immediately? Popup design: not sure about your popup copy? Why not try different designs? Coupon amount: wondering how coupon amount can impact your subscription rate? Test different coupons and measure the impact on your subscription rate. It can take some time before you get significant results. The significance of your AB test is estimated in your reporting. If you want quick results, limit the number of variants. The more variants you have, the longer it will take to collect data and thus get significant results. Make sure you're testing one element after the other. If your variants have a lot of differences, it will be harder to identify which elements really did the difference between your two variants. 4- You can add additional variants by clicking 'Add a WisePop' next to your campaign. Don't hesitate to contact us if you need assistance. To know then the test is significant, you can check your reporting page. Once you're ready to stop the test, you can click "Set as winner" next to the winning version. It will stop the A/B test and duplicate your variant into a new campaign.